Breakfast in bed is nice, but I prefer something a little more celebratory and romantic to mark Mother’s Day and all the work we mothers do. If you’re a chocolate lover (and what mother isn’t? ), consider my gourmet chocolate and wine pairings. Slip your husband a note on how to prep this party, then tuck the kids in bed and enjoy. It’s not so easy to pair wine and chocolate because dark chocolate tends to overpower wine and big red wines can make chocolate taste bitter. The best route to follow is pairing chocolate with a dessert wine that is a bit sweeter than the chocolate. Most moms have a chardonnay handy, but not necessarily a cellar full of dessert wine. But take my word for it and invest in a bottle or two. Save whatever is left for that dinner party you’re always dreaming of throwing! The bubbles cut the creaminess of white chocolate for an ultra-satisfying pairing. 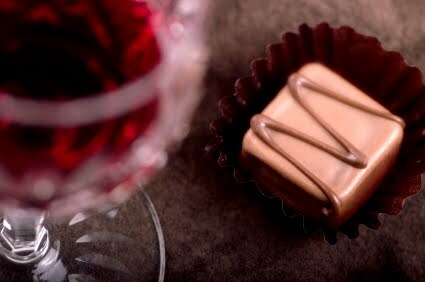 The truffle is white chocolate ganache spiked with Hangar One Raspberry Vodka and a fresh raspberry jam core, brought to you by the award-winning Sixth Course, a new San Francisco artisan chocolatier. Bridget Labus and Gianina Serrano, the pastry chefs behind Sixth Course, will be opening a shop in the Mission district this summer. More bubbles, but this time they’re pink with an irresistible aroma of strawberries and roses. This makes for a perfect pairing with creamy milk chocolate by beloved SF chocolatier Michael Recchiuti. The Piedmont truffle contains a whole toasted hazelnut and a chocolate gianduja filling. Recchiuti’s truffles are made in the Dogpatch, where he soon will be opening a café to complement his Ferry Building store. This tannat is a dynamite, sensual dessert wine made in Uruguay but sold right in downtown Mill Valley. It’s named after the Greek demi-goddess who threw herself into the sea when her lover died. The cocoa finish of this wine is a sublime match with an intense, single origin truffle by Michael Recchiuti. Bittersweet ganache is topped with cacao nibs from the renowned cacao growing region of Venezuela, the Sur Del Lago. Port and chocolate make the classic pairing. This fortified wine is bold enough to stand up to spice infused chocolates, like the locally made Poco Dolce tiles. This bite-sized tile contains cinnamon, ground chiles and roasted pumpkin seeds topped with grey sea salt. Poco Dolce means “a little sweet” in Italian and all of chocolatier Kathy Wiley’s pieces include savory ingredients to balance the sweet. If you are thirsty for more, get together a group of friends for the Gourmet Walks ULTRA Chocolate Tour in San Francisco. The tour features wine pairings, a chocolate martini and more!